Experience deep, long-lasting relief from anxiety for a happier you with TM, an effortless meditation technique proven by science. The relaxation in Transcendental Meditation (TM) dissolves deep-rooted stress and makes us more resilient. Elevated cortisol (stress hormone) levels interfere with learning, memory, lowers the immune function and bone density, increases weight gain, blood pressure, cholesterol, heart disease… the list goes on and on. A study of 300 students at the American University in Washington, found that anxiety and depression significantly reduced after a few months of TM practice. Students were better able to cope with the challenges of university life. 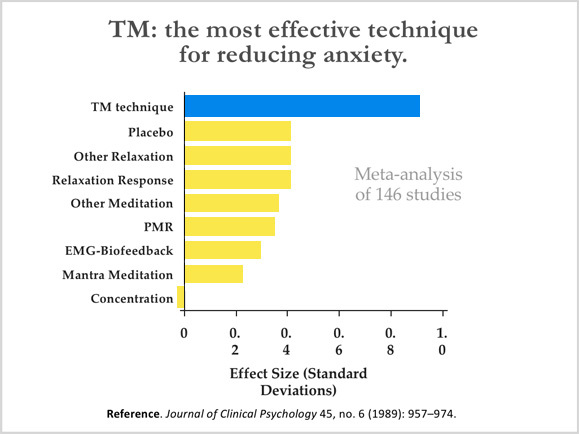 Another published study completed at Stanford University found that TM is the most effective technique known for reducing anxiety. Are you tired of saying? It’s time to Learn TM. 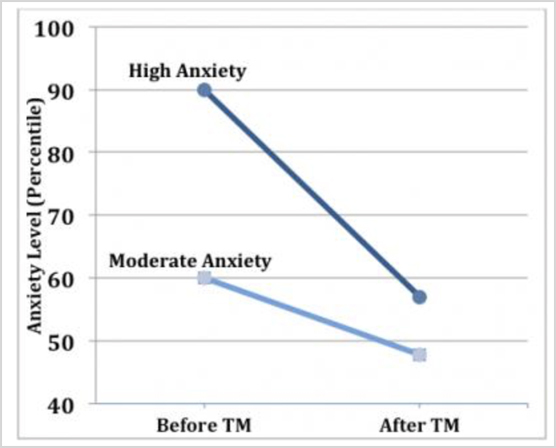 TM is effective at reducing trait anxiety for people with high anxiety. Trait anxiety is a measure of how anxious a person usually is, as opposed to state anxiety, which refers to how anxious we are at the moment. Studies show that individuals with extremely high anxiety levels (higher than 90% of the adult population) showed dramatic reductions in anxiety. Those that suffered a moderate level of anxiety (higher than 60% of the adult population) also showed reductions in anxiety.